When you need massive storage for your boat, RV, camper, trailer or other utility vehicle, come to Al’s 54 Boat Storage! With secure, clean, spacious units, we’re equipped to house even the biggest vehicles. Visit us 24 hours a day and experience customer service and satisfaction that’s second to none. Contact us today for unit availability and rates. Looking for a place to park your boat during the offseason? Need a storage unit that’s big enough to house your RV while you’re not traversing the roads? 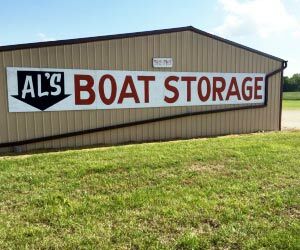 Al’s 54 Boat Storage welcomes your vehicle with storage units in Miller County, MO that are big enough to fit any sized boat, RV, trailer or camper! Our massive units range in size, including 27’, 30’, 32’, 40’ and 44’, giving you all of the room you need to stow your vehicle comfortably. And, with a massive lot and wide driveways, we make it easy to get in and out of your unit without any trouble. Our storage facility in Miller County, MO is protected at all times by CCTV cameras to deter anyone from tampering with your unit. We also sell high-security locks and can assist you in picking the right one for you. With 24-hour access and unit availability, you’ll never have to worry about getting into your unit, either! We aim to make self storage in Miller County, MO simple, easy and convenient. Speak to a member of our helpful staff today about unit sizes, rates and rental terms—we’ll make sure you get a unit that’s right for you, at a price that fits your budget. We provide our customers with units ranging from 27’ to 44’ in length, to accommodate all sizes of boats or vehicles. We’re available 24 hours a day so you always have access to your things. Our facilities are protected by CCTV cameras, so you always have peace of mind about the safety of your belongings. We offer flexible rental options, including annual payments with a free month, as well as prorating. Our customer service is second to none! We can even help you pick the right lock for your unit. Leave your boat or RV in good hands at Al’s 54 Boat Storage! We’ll help you find a unit that’s right for you and make sure it’s protected at all times. Contact us today for rates and terms.